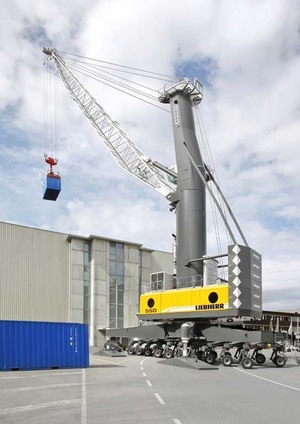 In January 2012, Liebherr-Werk Nenzing GmbH and Transnet Port Terminals in Durban, South Africa, signed a contract for the delivery of six mobile harbour cranes of the latest generation. These high-performance cranes, type LHM 550, are suitable for a wide range of application. The ultramodern machines are destined for the RoRo and Maydon Wharf Terminal in Durban. Currently the terminal mainly handles bulk. However, a steady increase in container-handling volume calls for an expansion of existing capacities. Thanks to these new LHM 550s the terminal is optimally prepared for future challenges regarding cargo handling and vessel delays are going to be minimised. Besides, this South African large order confirms a consistent positive trend. In the past five years, Liebherr has already delivered more than 70 mobile harbour cranes to the African continent. In this regard Liebherr is going to reach a special milestone this year, delivering their one hundredth mobile harbour crane to Africa. Delivery is expected in March 2012.